Our new Tank Bag shown here on an RS Venture TF features a clear map window flap which lifts up to reveal the gas cap for easy fill-up at the pump. 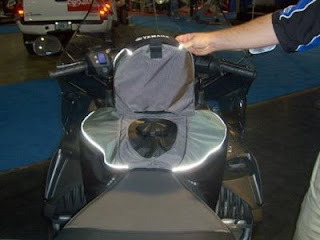 The contoured design hugs your snowmobile tank snapping on to existing rivets, it includes waterproof zippers, two retractable bottle holder extensions, three separate pockets, and premium black/grey styling. 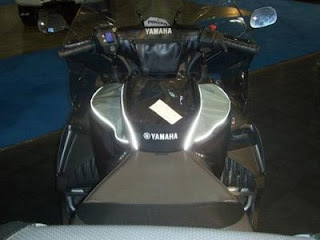 Trimmed out with the Yamaha tuning fork logo on the side and reflective piping. A nice looking bag it is. Essential for day trail rides or overnights. Fits most Yamaha Mountain, Rough Trail, Trail Performance, Multi-Purpose and Touring snowmobile models such as: Apex, Attak, RS Vector and RS Venture GT. When shopping our snowmobile accessories select the year and model of your snowmobile to view a complete list of genuine Yamaha accessories that custom fit your machine. 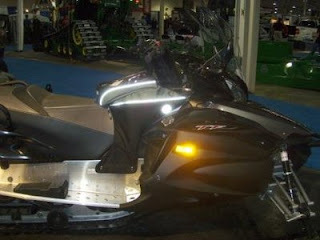 View Yamaha snowmobile parts and microfiche on our our Yamaha parts pages.